Looking for a HTML5 template with clean, modern design & having multipurpose usage? Which is equipped with state of the earth technologies like Bootstrap 4 and Syntactically Awesome Style Sheet (SASS) language? Most importantly, which will assist you to create your site with ease and comfort? Surely you’re in the right place! 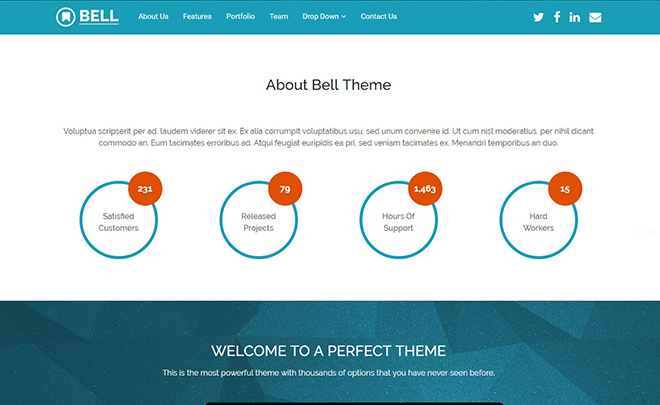 Today, here in Themewagon we’re adding an outstanding Free Bootstrap 4 Multipurpose Template known as Bell. So, take a deep breath. Come with me. Let’s explore what this multipurpose template has to offer us! Various features and modern technologies make this a template to get. To start with, its slick, clean & minimal design along with SASS based code makes it stronger both on the front and back end. Then, Bootstrap 4 ensures responsiveness on every single display. Furthermore, beautiful parallax effect runs throughout to soothe the view of anyone visiting. 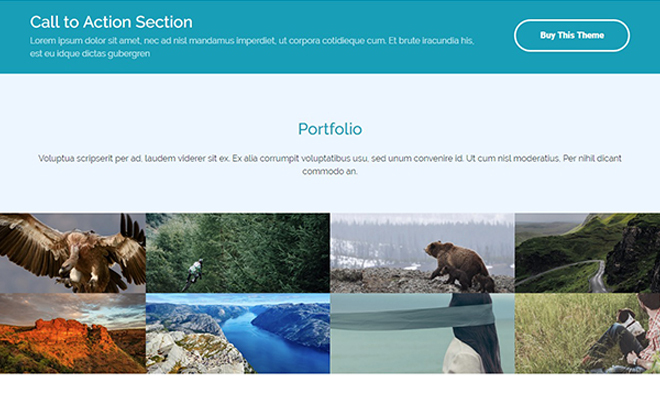 Additionally, some other features like animated scrolling, counter, on-hover effect, different necessary buttons (call to action, ghost, back to top), a multi-level drop-down menu make this template even more usable! You don’t have to be a tech geek or nerd to be familiar with the awesomeness of Bootstrap. By far, it is the most used CSS framework to make sites responsive. And who doesn’t know that every newcomer is always expected to be better than it’s antecedent? Bootstrap 4 is the latest gift to the community. Though it is still quite early to tell, Bootstrap’s reputation, reviews and the hype it recently created surely indicates towards one thing. Bootstrap 4 is going to dominate the scenario! And guess what, Bell’s creator made the anticipation early. Bootstrap 4 Beta is the building block of it. Still confused? Check the responsiveness here. Multiple sections of this one-page template are pretty useful too. The sticky navigation bar sticks all throughout the page for the sake of an easier navigation experience. 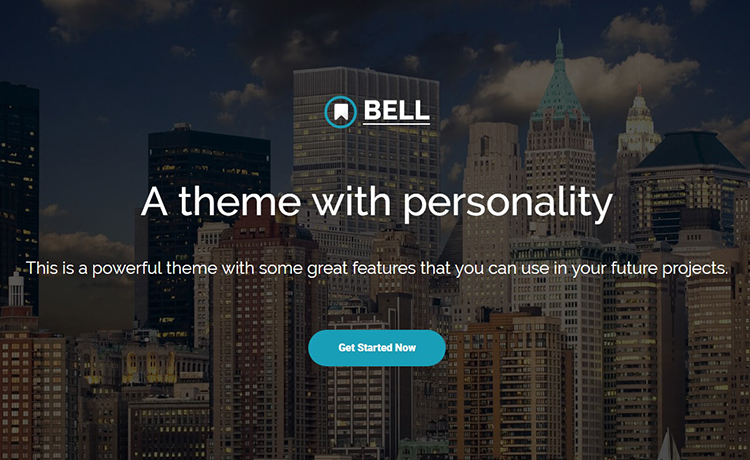 Sadly, the free version of Bell doesn’t include a working contact form. But, you can smartly overcome the obstacle by using the social media icons. Their location is in the top right corner of the navigation bar. Then, the portfolio & team section are there for your showcasing. Furthermore an animated counter and call to action section can also be useful. Lastly, use features section to display what special features you or your company offers. As mentioned earlier, this is a multipurpose template. With a minimal or almost no effort, you can turn this into a beautiful website of your own. Firstly, this one-page template has potential use as a startup company an agency or as a business or factory web-page. Creation of a real-estate or construction page is also possible with this Free Bootstrap 4 Multipurpose Template. Furthermore, if you’re thinking of creating a consulting or finance website, that is also possible! Basically, it has the potential to become any one-page business website. You just take care of the image, color, and texts of your website. Everything else is already taken care of! And who did the taking care of those? BootstrapMade. It’s because of them you’re getting this wonderful template free of cost! Thanks to them. You seem to like this Free Bootstrap 4 Multipurpose Template. So, why don’t you check all the Free Templates offered by Themewagon? There are tons of them out there! Waiting to be picked up by you. Then again, better things come with better prices. For stunning templates visit all the Premium Templates. Then, make sure you check our Blog too. Lastly, don’t forget to have a nice day!